You know what they say about starting them from young – if you are a huge fan of the Doctor Who series, then you would want to introduce your progeny to the likes of Daleks, the concept of time travel, as well as the Tardis, and if your teen has grown up to be a responsible adult, how about bonding over a few shots of tequila the next time you meet, and to chat about all things Doctor Who? You might as well set the stage for the occasion with the $19.99 Doctor Who Disappearing Tardis Pint Glasses, and these pint glasses will do exactly as they were meant to – that is, carry your favorite alcoholic beverage in shot glasses, with the Tardis turning bright blue with cold drinks inside. Each of the Doctor Who Disappearing Tardis Pint Glasses will be able to hold 16 ounces of liquor, and remember not to dump these into the dishwasher once you are done with it as you would want to preserve the “magic”, so to speak. 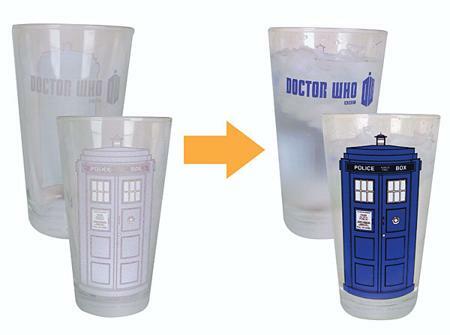 You will get a set of 2 color-changing Tardis pint glasses, where at regular temperatures, the Tardis would remain a pale blue.